IT was 54 days that rocked Newcastle United to its very foundations – and prompted a sea change in attitude that is still making waves to this day. Confronted with a rapid and a worrying tailspin towards the Championship some three years ago, Derek Llambias hatched an audacious plan to resuscitate the fortunes of Mike Ashley’s ailing football club. He wanted to appoint Alan Shearer as Newcastle’s interim manager. The owner, apparently, took some convincing. Having been burned by the effect of bringing in club legend Kevin Keegan he was loathe to open another Pandora’s Box at such a crucial time of the season – especially given that he was not particularly close to United’s all-time top goalscorer. Ashley is a man who deals in trust. But Llambias, who told The Journal last month that he had “no regrets” over the decision, sold it to his owner. Harnessing public opinion and a man of obvious football intelligence seemed like a dream ticket, and the offer was put to a man desperate to help out. So on April 1, 2009 it was announced that Shearer would take over as Newcastle manager. The popular perception is that it was a failed project but, three years on, it feels like time for a proper reassessment of eight incredible weeks. Enough water has passed under the bridge and all the main players in the romantic – but ultimately failed – bid to rescue United from relegation have sufficient distance from the events of spring 2009. It is true that Shearer – along with assistant Iain Dowie, who declined an offer to talk to The Journal about the fateful end-of-season spell – did not have enough to save Newcastle from dropping into the Championship. Momentum ran away from the interim boss and his points total was not quite enough to prevent that humiliating, damning denouement at Villa Park. Shearer has not managed since and United have not looked back. But how important was the club’s all-time top goalscorer in tapping into the spirit that Chris Hughton later mined to drag United out of the Championship? Privately, it is acknowledged that the job was much bigger than anyone had anticipated when he took over. Shearer inherited a squad of individuals and his best player – Michael Owen – had been dented by injuries and a loss of belief. A striker that he believed would be the key to keeping United in the division was eventually dropped as Shearer searched for another formula to get the goals that would have kept Newcastle afloat. Team spirit had disintegrated and little tricks that the new manager tried to pull – such as getting the team to eat together – were not enough to shake the lethargy from a few individuals. One of the few survivors of that period, Shola Ameobi, recalls the situation that confronted United’s ‘Red Adair’ when he entered a fractured dressing room. “It seems like a lifetime ago and it went by in a blur, really. Obviously Alan came in during a desperate situation,” the striker recounts. “We weren’t picking up points and we weren’t playing well. There was a lot of unrest in the team as well, which ultimately culminated in the team going down. “It was a difficult job that he took on. To be honest, it wasn’t a great time for the club but I think there were some foundations laid down. There lies the key to what Shearer was trying to do. 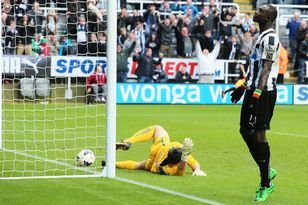 A recovery that, in the end, took Newcastle one chastening season in the Championship and a clearout of the waverers to achieve was attempted in eight weeks. It was ambitious and needed to be done, but there was simply not enough time for Shearer to make a success of it. Credit to him for taking risks, though. At that point Hughton still thought of himself in public and in private as an assistant manager at best, and there was a lack of conviction in some of the decisions he made. Fatally, Hughton did not see the raw, barnstorming promise of young colt Andy Carroll – who offered a compelling alternative to an apparently all-star strikeforce that was, in reality, more of a busted flush. Shearer rolled the dice when it came to the Gateshead-born Academy graduate and helped to bequeath a rich, £35million legacy to the club. Ahead of his return to St James’ Park, Carroll said as much. “Okay, Shearer was only at Newcastle for a short time (as manager) but his presence, his aura, was special,” he said. “It was always about Shearer. I loved the way he scored all kinds of goals.” Sunday will mark the three-year anniversary of Shearer’s appointment and the Newcastle board have learned much since then. They are less instinctive and there is more resilience about their decision-making. The quiet appointment of chief scout Graham Carr in the first weeks of the following season kick-started a renaissance that continues to this day. Shearer played an unheralded part in starting that process, but the work of Hughton and now Alan Pardew has been stunning. Newcastle can move into fifth on Sunday if they beat Liverpool; and their team will include three of those who played for Shearer in his first game in charge. As for Shearer, it remains to be seen whether he can become a sustained managerial success. But Paul Ferris, who was performance director during Shearer’s short reign, believes it will happen. “I had a lot of faith in his ability to be a great manager and still do – that is why I actually took the job,” he said this week. One of United’s greatest servants, he remains at St James’ Park. Reinvented himself this season. Now a key man under Alan Pardew. One of the first to jump ship following relegation. Now at Doncaster Rovers. Stuck it out following the club’s demotion. Now skipper and one of the Premier League’s most accomplished centre-backs. Left for Liverpool last summer. Returns for the first time on Sunday – with his new club trailing United by eight points. One of the few Shearer could rely on. Remains at United, having signed a new contract earlier this season. Endured after relegation and helped the club back into the top division. After a short stint in China he is now retired. Bounced back after relegation to enjoy two fine seasons. Now captain at West Ham. Still at Newcastle but looks set for a summer exit. Injury will rob him of his St James’ Park swan-song. Won the League Cup with Birmingham City. Now with Rubin Kazan in Russia. FOR one of the few times in his football career, Andy Carroll expects to be nervous at St James’ Park on Sunday.